Discovery of therapeutic agents typically follows predetermined paths guided by the specific molecular type of modulator. For example, small molecule drugs are discovered through screening or rational design, while large-size antibody biologics are identified and optimized through affinity selection and maturation technologies. While the candidate molecule is often modified very significantly in terms of structure and sequence, its type remains the same throughout the optimization process. In the work by Kadam et al., the team has managed to cross over from the antibody therapeutic to the small molecule-like peptidic agent category to generate blockers of influenza virus fusion. The authors started with broadly neutralizing antibodies against the virus, directed against hemagglutinin, and applied an extensive optimization strategy aimed at decreasing the size of the active molecule. Precise epitope mapping combined with structural biology allowed the identification and optimization of peptide blockers of approximate molecular weight of 1000 Da, for a reduction of more than 100-fold (Figure A-D). The peptides retained strong binding affinity and potency against influenza virus, as determined by surface plasmon resonance, AlphaLISA competition assay, and virus neutralization assay. A mechanistic study was also conducted to understand the basis for the high potency of these peptidic agents. Moreover, the pharmacokinetic properties of the new agents were good overall, with half-lives in mouse and human plasma of several hours. This crossing over from the antibody to small molecule therapeutic category can serve as an example to guide future such efforts aimed at improving the success rate of small molecule therapeutic development. * Abstract from Science 2017;358:496–502. Influenza therapeutics with new targets and mechanisms of action are urgently needed to combat potential pandemics, emerging viruses, and constantly mutating strains in circulation. 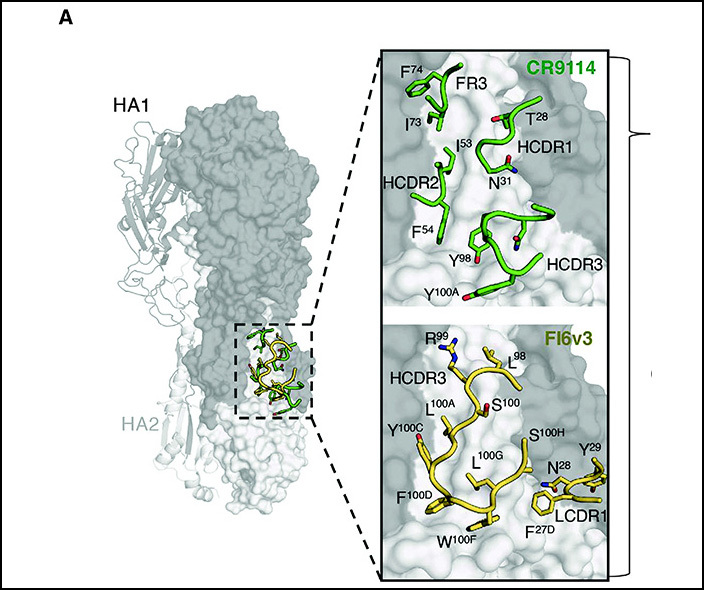 We report here on the design and structural characterization of potent peptidic inhibitors of influenza hemagglutinin. The peptide design was based on complementarity determining region loops of human broadly neutralizing antibodies against the hemagglutinin (FI6v3 and CR9114). The optimized peptides exhibit nanomolar affinity and neutralization against influenza A group 1 viruses, including the 2009 H1N1 pandemic and avian H5N1 strains. The peptide inhibitors bind to the highly conserved stem epitope and block the low pH–induced conformational rearrangements associated with membrane fusion. These peptidic compounds and their advantageous biological properties should accelerate the development of new small molecule– and peptide-based therapeutics against influenza virus. (B) Overlay of the hydrophobic groove-interacting side chains from CR9114 HCDR2, HCDR3, and FR3 (green) with the HCDR3 loop from FI6v3 (yellow). CR9114 FR3 residues occupying one of the hydrophobic cavities on the HA stem not occupied by FI6v3 are highlighted with a dashed red oval. (C) Blueprint of the peptides constructed by merging features from the HCDR3 loop of FI6v3 (yellow) with FR3 of CR9114 (green). Nonproteinogenic amino acids (NPAAs) used to link features derived from the two antibodies are shown inmagenta. (D) Representative peptides from this study. Amino acid sequences are shown for HCDR3 of FI6v3, linear peptide P1, and cyclized peptides P2 to P7, with the chemical structures of corresponding NPAAs illustrated below. Suc, succinyl; Ac, acetyl; ter., terminal. Single-letter abbreviations for the amino acid residues are as follows: A, Ala; C, Cys; D, Asp; E, Glu; F, Phe; G, Gly; H, His; I, Ile; K, Lys; L, Leu; M, Met; N, Asn; P, Pro; Q, Gln; R, Arg; S, Ser; T, Thr; V,Val;W,Trp; and Y,Tyr. ASSAY & Drug Development Technologies, published by Mary Ann Liebert, Inc., offers a unique combination of original research and reports on the techniques and tools being used in cutting-edge drug development. The journal includes a "Literature Search and Review" column that identifies published papers of note and discusses their importance. GEN presents here one article that was analyzed in the "Literature Search and Review" column, published in Science titled "Potent peptidic fusion inhibitors of influenza virus", authors are Kadam RU, Juraszek J, Brandenburg B.